This post was initially devoted to all sorts of weird happenings over the first week of the NBA’s season. Michael Carter-Williams and the 76ers tanked so hard they ran over every team with their tank (until the Warriors ran them out of their own building), Boston was in pole position for the 2014 Draft as a result of the 76ers’ (and Suns’) unexpected starts, there were struggles from Derrick Rose and John Wall, and Milwaukee’s bench (21.5 points per game per-48-minutes) was the third-stingiest in the league and gave the incredibly average Bucks some hope for the postseason again. But screw it. Of all the storylines to discuss, I wanted to write about what could possibly be this decade’s Rasheed Wallace in Detroit: Josh Smith. We’ll take a look at his offense through three measly games. Last season, Smith took 363 shots (!) between ten feet and the arc which were good for just 30.5 percent. He also made only 29.9 percent of the 221 threes he hoisted. Overall, he was only a 30 percent shooter when he took jump shots. That’s just not acceptable for anyone, let alone a player where well over half of his field goal attempts were came from them. It triggers the same reaction I had about Wallace, who’s now on the sidelines for the Pistons: Just get in the paint! Wallace was a much better three-point shooter than Smith has ever been, but the Pistons of the mid-2000s could’ve used more of a paint presence alongside the barrage of mid-range jumpers they were known for taking (but at least they made a respectable percentage of them). Fast forward to this season as Smith enters the first year of his four-year, $54 million contract with the Detroit Pistons. The paint, where Smith is so good yet often neglects, is even more crowded with Andre Drummond and Greg Monroe starting alongside Smith, who’s now playing small forward. 25.6 of Smith’s 40 minutes per game have been spent with Drummond and Monroe with respectable results so far. Detroit’s outscored their opponents by 1.4 points per 100 possessions when all three are on the court. But Smith’s shot selection has been controversial as usual. He’s averaging 7.3 three-point attempts per game — including an 11-attempt outing in a three-point loss at Memphis — and making only two on average. That’s good for 27.3 percent and he’s shooting only 20 percent on jump shots overall. Smith’s more than doubled his three-point rate from 2013, with 44 percent of his shots coming from beyond the arc. If anything, the frequency of his three-pointers could turn into a drinking game. As a result, his free throw rate has been sliced by more than half. Smith’s typically been below average from the line, shooting a career-worst 51.3 percent last season, so there could be a correlation between that percentage and the decline in free throw attempts overall. But it could also be the result of a feeling out process now that Smith is playing with two frontcourt players who also work around the painted area. He hasn’t hugged the dead zones (at least so far) like in previous seasons. 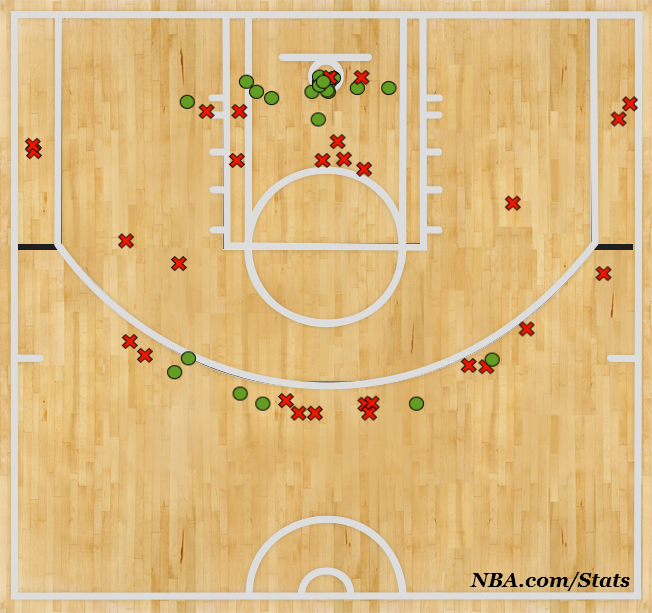 Only five of his first 50 shots have come between ten feet and the arc while eight have been attempted from five to nine feet where Smith has also typically struggled (and continues to do so, making just two shots from that area so far). The rest of his shots (15) have come within five feet where Smith’s been terrific, making 13 of them for an 86.7 percent mark. It would be nice to see more of his shots taken there—as well as his three-point rate dropping back to a less-ridiculous level for his skill set—but Smith would be viewed differently so far if a couple more of those threes dropped. If anything, his shot chart actually looks promising even if all the X’s from the arc say otherwise. If he’s going to chuck the long-range jumpers — and there’s barely a difference in accuracy between his 18-footers and three-pointers — wouldn’t you rather have Smith chuck from behind the arc? If both go in at a 30 percent clip, it’s an extra 0.3 points per attempt when Smith shoots from three. Whether that cures the headaches of fans of Detroit though is anyone’s guess. We’ll see if his offense improves as the season goes on or if dedicating a post to his shot selection, with a tiny, tiny sample size, was just a waste. ← What in Kevin’s name is going on here? Now the only problem would be that he actually need to hit his 3s consistently. That’d be huge lol. Just not sure it’s going to happen. Making just a third would be nice…or at least less horrific.